Positive thinking is expecting good and favorable results. An optimistic mind waits for happiness, health and a happy ending in any situation. Is it an easy mindset to cultivate? Yes and No! It solely depends upon the way you directs your thought. As you meet more successful people, you will understand that the success they enjoy now is the result of a shift in their mindset towards optimism. They changed their lifestyle around positive thinking. 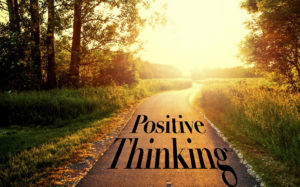 Let’s see how you can practice the power of positive thinking to achieve greatness and optimal life…a life you truly love. Successful people have an aversion to the word “can’t”. When you restrict yourself from something because you think that you “can’t” do it, you are only withholding your great potential. You CAN do it. We all are capable of greatness. Tip: Recite “I CAN do this” to yourself 7 times when in doubt. Often, difficult times will create self-doubt of whether you are capable and deserving of what you want to achieve. Shift such thoughts to words that enhance your confidence. Talk to yourself about the talents you already have and create a higher self-esteem. This will help you to be more optimistic. When you feel like you are in a rut, think about the struggle you have faced to reach this far. You got to tell your mind that striving for progress is the key to success. It is easy to give up, but the champions are the survivors. Train your mind with positive affirmations like “No matter what, I won’t give up”. Make use of a goal setting app to keep you on track with the necessary actions that take you to a higher level. Be it a personal goal or professional one, have fixed goals with deadlines to complete and track your progress on the go. Enjoy an outdoor run, a date night with your spouse or a hangout with friends. Set a reward that excites you. This motivates you to do the tasks at hand and create a positive outlook to achieve the goal. You will find it difficult to motivate yourself when the tasks seem to be a lot bigger than you can deal with. Divide the goal to small chunks of easily achievable tasks. Micro goals motivate you to move on to next tiny step without overwhelming you. Find ways you can share your emotions and thoughts. If you find it comforting to talk to your friend, spouse or a close family friend, share it that way. Or if you are a person who likes to keep things more personal, a journal app or just writing on a notebook can give you a greater clarity of thoughts and emotions. I’m still learning from you, but I’m trying to achieve my goals. I certainly enjoy reading all that is posted on your website.Keep the aarticles coming. I loved it! Hello there, You’ve done a fantastic job. I will definitely digg it and personally suggest to my friends. I am sure they’ll be benefited from this site. Quality articles is the key to interest the visitors to pay a visit the web site, thats what this web page is providing. Youre so cool! I dont suppose Ive learn anything like this before. So nice to seek out any person with some authentic ideas on this subject. realy thanks for starting this up. this website is something that is needed on the net, someone with a bit originality. helpful job for bringing one thing new to the web!